Alexion Pharmaceuticals, Inc. (NASDAQ:ALXN) stock was up today on positive results for a recent Phase 3 clinical study. The good news from the clinical trial is for Alexion Pharmaceuticals, Inc.’s ALXN1210. This is a drug that is meant to treat complement inhibitor treatment-naïve patients with paroxysmal nocturnal hemoglobinuria. According to Alexion Pharmaceuticals, Inc., ALXN1210 shows that it is able to treat its target patients without showing inferiority to Soliris. This includes meeting its co-primary endpoints of transfusion avoidance and normalization of lactate dehydrogenase. To go along with the success of meeting its co-primary endpoints, the drug also was able to meet all of its secondary endpoints as well. They are as follows. Percentage change from baseline in LDH levels. Change from baseline in quality of life as assessed by the Functional Assessment of Chronic Illness Therapy-Fatigue scale. Proportion of patients with breakthrough hemolysis. Proportion of patients with stabilized hemoglobin levels. Alexion Pharmaceuticals, Inc. notes that not only did ALXN1210 show that it wasn’t inferior to the company’s own Soliris drug in these treatments, but that it was actually favored by the Phase 3 clinical study. 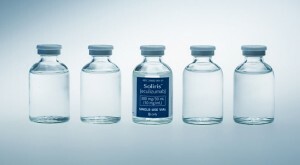 The safety of the drug was also comparable to Soliris. To go along with this news are plans for Alexion Pharmaceuticals, Inc. to introduce the drug to regulators in the second half of 2018. The company notes that this will have it submitting the drug for approval to regulators in the United States, European Union, and Japan. ALXN stock was up 3% as of Thursday morning. Article printed from InvestorPlace Media, https://investorplace.com/2018/03/alexion-pharmaceuticals-stock-up-on-study-results/.